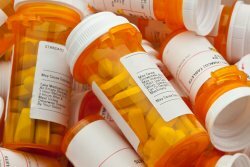 The concurrent use of multiple medications by a patient is called polypharmacy. Since geriatric patients are more likely to need multiple medications to treat a complex medical condition, polypharmacy is more common in older adults. The risk of experiencing a drug interaction also increases because seniors are more apt to be treating more than one chronic problem at a time. According to a recent Consumer Reports survey, about 40% of adults ages 65 and older take five or more drugs each day. Although polypharmacy can be beneficial for patients, its practice increases the patient's risk of drug-related problems and is often associated with adverse health outcomes like visits to the ER. It's not just America's love affair with prescription medications causing all of the concern. You cannot assume that because you can purchase something over-the-counter (OTC) it is harmless. Taking multiple OTC's, such as a cough syrup and a headache medication containing Tylenol (acetaminophen), can be very dangerous. In 2010, the American Geriatrics Society reported overdoses of acetaminophen led to 78,414 emergency room visits. Moreover, when they are taken with prescription drugs, even vitamins and dietary supplements can lead to serious drug interactions. One of the main concerns expressed by the American College of Physicians is how aggressive should a treatment program be when prescribing medications for an aging adult. Also, does the potential benefit of a prescribed drug decline with a patient's age? For example, one study concluded that diabetes medications were responsible for almost 1/4 of senior emergency room hospitalizations. Recognizing the natural aging process can lead to polypharmacy problems, the American Diabetes Association now says doctors should talk with healthy adult diabetic patients about aiming for an A1C of 7.5 rather than 7, as a measure of his or her long-term blood sugar readings to reduce their risk of low glucose levels. To ensure "good" polypharmacy, patients and doctors need to be more aware of what meds the patient is taking and whether the patient truly needs to continue with the same dosages. By relying on a primary care physician or internist (a doctor of internal medicine that specializes in adult diseases) to manage medications for multiple morbidities and/or complex diseases, there can be better control over medications, supplements and OTC drugs that a senior is taking. In addition, eliminating situations of problematic polypharmacy could lower everyone's risk of unwanted drug interactions. If you're ready to take full control of your medication regimen, schedule an appointment at one of the three PrimeMED locations. Our board certified physician can review all of your conditions and treatment protocols to establish a medication management procedure that is personalized for your unique healthcare needs.